We are a top-notch organization, engaged in providing Majuphal Mayphal Quercus Infectoria. Backed by rich industry experience and market understanding, we are involved in offering a wide array of Majuphal Herb to our valued patrons. Quercus infectoria (Aleppo oak) is a species of oak, bearing galls that have been traditionally used for centuries in Asia medicinally. Manjakani is the name used in Malaysia for the galls; these have been used for centuries in softening leather and in making black dye and ink. 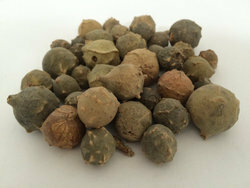 In India the galls are called Majuphal among many other names. We take pleasure in introducing ourselves as leading firm by offering Dry Gallnut. It is rich in tannins and also have anti-viral and anti-septic. They are used in treating pharyngitis, diarrhea, dysentery, hemorrhoids, gonorrhea, virginal infections, including leucorrhea. Other Name: Mayphal, Oak galls, Mazu fruit, Quercus Infectoria, oak tree fruit. Quercus infectoria is a small tree or shrub with glabrescent leaves, with spiny teeth. This oak tree prefers partial shade or partial sun to full sun, and requires moist soil. 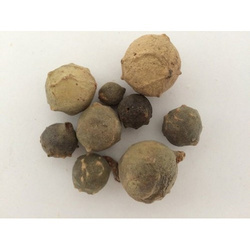 Quercus infectoria, the Aleppo oak, is a species of oak, bearing galls that have been ... Also known as Majuphal in Indian traditional medicine, manjakani has been used as dental powder and in the treatment of toothache and gingivitis. We provide Majuphal to our clients among other items. - Botanical Name : Quercus Infectoria. - Common Name : owny Oak, Gall Nut, Oak Gall Tree. • Benefits: Majuphal is used as a hair dye, Majuphal is used for gargling in pharyngitis and stomatitis. With a huge year of knowledge in this industry, we are engaged in offering a highly superlative Quercus Infectoria Extract Powder. These are precisely prepared using optimal quality inputs and cutting edge technology by adept personnel. This can be acquired by our clients in prescribed quantities as per their demands. This species is native of Greece, Asia Minor, Syria and Iran. The galls of this plant as well as of some allied species are imported into India.